The history of Fieldings Crown Devon spans more than a hundred years from 1878 until 1982. During that period the company experienced two very distinct peaks in terms of design and output. 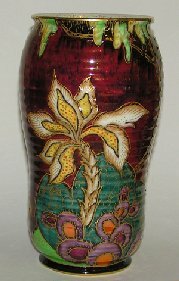 The first period saw the company achieve great success with high quality ‘Vellum’and hand painted wares. The second major phase of the company’s success arrived with designer, Enoch Boulton, in 1929 and lasted until the outbreak of World War Two. Boulton’s influence as an Art Deco designer of note carried the company to new heights. One of the features of this later period was a ‘neck-to-neck’ commercial race with rival Wiltshaw and Robertson for supremacy in working and middle class markets. 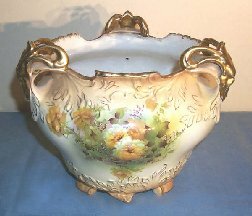 In 1878 Simon Fielding, the owner of a colour mill, bankrolled a group of potters to manufacture majolica, green-glaze wares, toilet wares and fancies. Hackney, Kirkham & Co languished soon after and the Fieldings family took over the pottery to preserve their investment. From those rather shaky beginnings, Fieldings rapidly built a business of note, greatly extending the range of products and exploiting market gaps in fancy tablewares, toilet wares, art vases and dinnerwares. By the turn of the century the company was recognised in the trade press and indeed the marketplace as a leading manufacturer of a vast range of quality products for middle class Britain. The company’s expansion was underpinned by a range of labour saving advances and design breakthroughs. Abraham Fielding, son of Simon, is credited with the invention of a gas flow-through biscuit oven that allowed major efficiencies and savings. He also invented new glost oven designs, revolving dryers and implemented numerous other improvements that placed the Fieldings factory in an enviable commercial position. Fieldings had seven of the largest kilns in the potteries and the practice of improving quality and efficiency, coupled with constant release of new lines, strengthened Fielding’s position in the domestic and overseas markets. Collectable early period wares include a broad range of Vellum shapes in patterns such as Thames, Etna, May, Elm, Erin and Wick. Good quality examples of Indian are also highly collectible as is early Majolica. Fieldings also produced a range of ‘Royals’, such as the eminently collectible Royal Devon, Royal Chelsea, Royal Windsor, Royal Sussex and many others featuring extensive hand painting of the patterns. 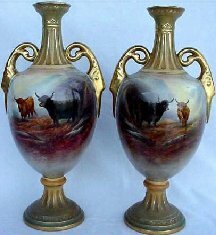 Art vases, plaques and chargers, similar in style to Royal Worcester, featuring hand painted roses, peacocks, cattle, rural scenes, and dogs are highly sought after and fetch high prices at auction. Most of these pieces are signed. Some of the most sought-after Fieldings Crown Devon wares are from the 1930s. In 1929, when Abraham Fielding was in the twilight years of his life, he began a talent search to fill the gap that would be left when he went into semi-retirement. His choice to lure Enoch Boulton away from his major competitor, Carlton Ware, to take on the role of design chief at Crown Devon was a masterstroke. It helped create conditions for a unique combination of inspiration, motivation and expansionary zeal that positioned Fieldings to make the most of the economic circumstances of the time. One of Boulton’s great successes was Mattajade, which, combined with a rich array of sybaritic designs is one of the most collectible of all Crown Devon patterns today. Another success was the Amazine ground. 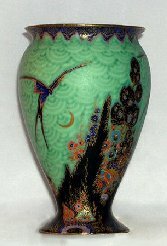 A matt, azure tone emulating the lightest of turquoise colouring, it provided an ideal canvass upon which to create enamelled designs, amongst which were the Swallows and Exotic Bird patterns. The Mattita, Mattasung and Mattatone series are further examples of Boulton’s genius as a designer. He was particularly prodigious in producing designs and shapes for the Mattita range, from quirky novelties to modernistic shapes hosting dramatic Art Deco designs. He is also responsible for Crown Devon’s highly popular musical novelties. In fact, he can be seen as a trailblazer in the design and manufacturer of musical novelties in the United Kingdom. His Daisy Bell musical jug, incidentally, became a favoured possession of the young Princess Elizabeth. Boulton worked with Kathleen Parsons, Margareta (Greta) Marks, a Bauhaus graduate, and Olga Hartzeg to produce many of the most memorable Crown Devon figures, of which the Flapper, Rio Rita, Peasant Girl and Russian lady with Borzoi are some of the most memorable. 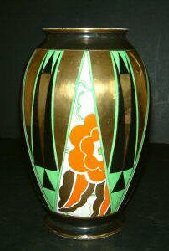 Boultons lustre wares are the equal of anything that came to market in the 1930s. 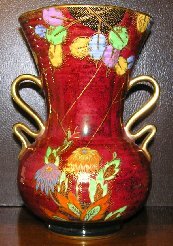 The most decoratively important and collectible Crown Devon patterns include Fairy Castle, Parrot, Spider Web (Copied by Carlton Ware) Fantazia (More decoratively balanced than Carlton’s Fantasia), Swallows, Coral Trees, Dragonfly, Dragon and some of the later sybaritic floral patterns. 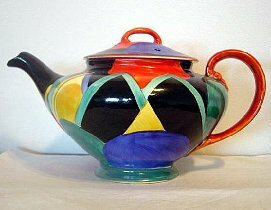 More often than not Boulton opted for sybaritic Art Deco design for his lustre wares, while Carlton Ware in many instances chose to follow the path of modernism. There is curious and somewhat uninformed snobbery occasionally expressed by Carlton Ware collectors and sometimes reciprocated by Crown Devon devotees in respect to the superiority of one factory’s lustre wares over the other’s. It is more accurate, however, to state that both Carlton and Crown Devon produced lustre and other wares of such matching quality, brilliance and beauty that it is churlish to enter into games of one-upmanship. There has been some ill-informed comment in books written about Carlton Ware that state Carlton Ware slip mouldings are sharper, lighter and better decorated than their Crown Devon counterparts. This type of boorish chauvinism can, in best light, be seen as a extension of the long tradition of rivalry between the two companies, or, in worst light, as ill-informed, self-serving and indeed technically naïve. The period 1930-39 represents a creative zenith of the Crown Devon factory. It was during this period that Fieldings made vast improvements in both the design and quality of surface decoration on its wares. 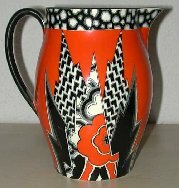 Having overcome foreign competition in the early 1930s, it was yet to weather the post-war storm of cheap, inferior Japanese and European product that impacted on England’s capacity to produce finely crafted, labour intensive wares at competitive prices, and which, ultimately, led to the demise of many Staffordshire potteries including Crown Devon. Boulton left Fieldings in 1950. The company traded very successfully until the 1970s when recession and overseas competition forced it to finally close its doors in 1982.